Some of Rockman’s greatest allies and enemies have come from alien origins. 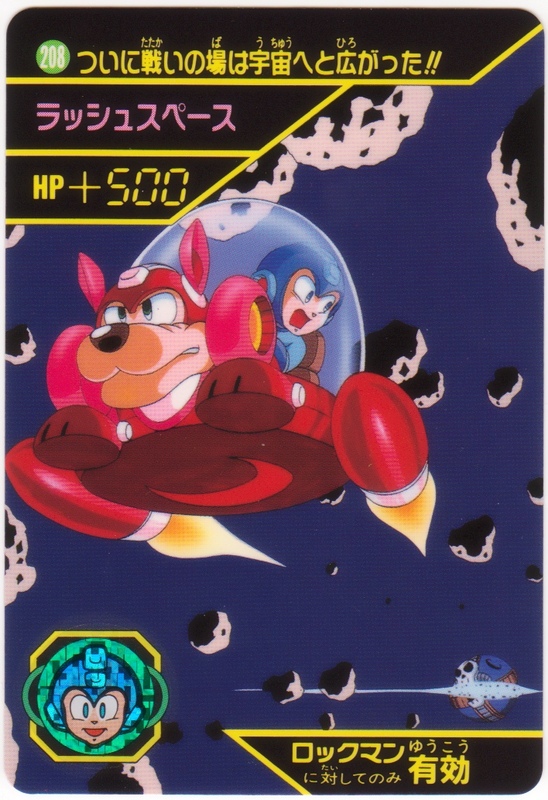 The outer space theme really picked up in Rockman 3 and the Rockman World series, with Dr. Wily regularly creating space bases or utilizing extraterrestrial technology to create his robots. To meet these challenges, Rockman often relies on the vehicle-morphing powers of his robo-dog, Rush. With Rush Space mode, Rockman makes the space lanes safe once more. In this scene from Rockman World 5, Rock and Rush dodge asteroids as they escape the exploding Wily Star. 208. At last the battlefield has expanded to outer space!! 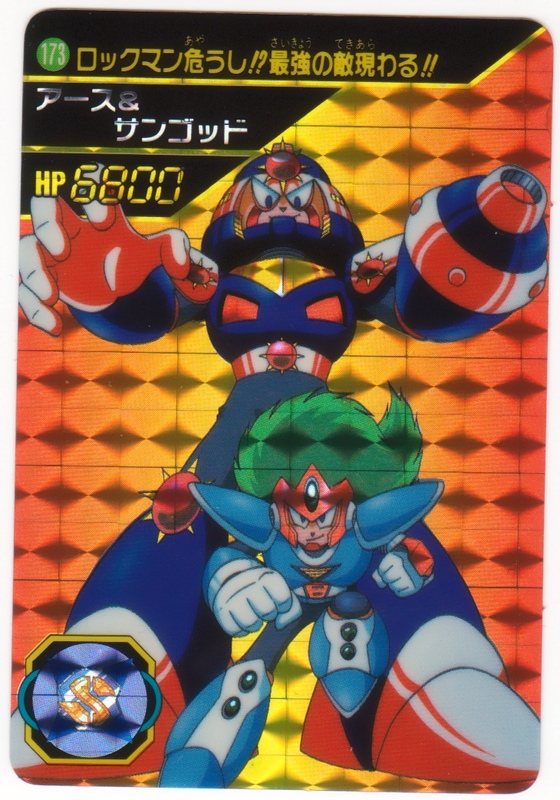 Rockman World 5 was all about space, and introduced two extremely dangerous robots to Rockman’s rogues gallery: Earth (also known as Terra), and Sungod (aka Sunstar). 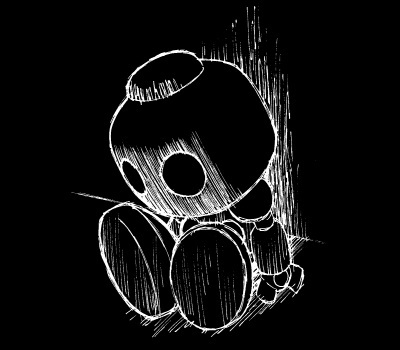 Earth is a powerful warrior and leader of the Space Rulers (Stardroids), while Sungod is the ultimate weapon of a lost ancient civilization. Rockman had to face off with both of these robots to save the Earth (planet) from widespread destruction. These guys were also a main focus of Hitoshi Ariga’s most recent Rockman mangas, Rockman Gigamix 2 and 3. 173. Rockman’s gravest threat!? The strongest enemies unveiled!! But that’s just the tip of the iceberg when it comes to space. Other powerful threats, like the mysterious robotic ninja Shadowman, the life-threatening Evil Energy, and the cruel interstellar super-computer Ra Moon all hailed from somewhere in the cosmos. 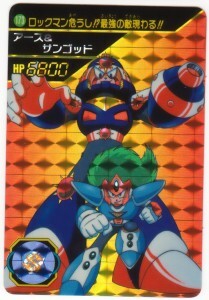 But so does Duo, one of Rockman’s most powerful allies! And on mobile phones, Rockman suits up to rescue endangered astronauts in the appropriately titled Rockman Space Rescue (which you can also get on old Blackberry phones, and some others for free too! I haven’t actually tried it yet though). Is space the final frontier for Rockman, or just the beginning? Our countdown keeps reaching for the stars tomorrow! 2 Comments to "Carddas Countdown Celebration: 6, 5…"
Agreed. Terra is an awesome design that needs to return in the games someday.